Mike and I decided to take a trip from our Northern VA home westward towards the valley ridge area of Western VA and West VA.Our plan was to make as many stops at state and national parks within a two and half day period until we reached our final destination West Virginia. Our first stop landed us at Sky Meadows State Park in Virginia. 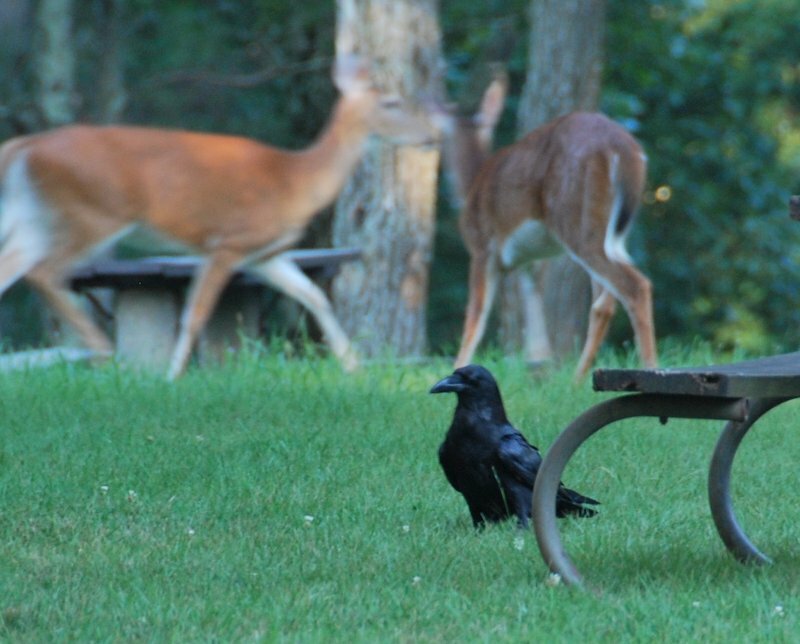 A nice, scenic spot rich in American History and birds. No herps but not to say they aren’t any there. 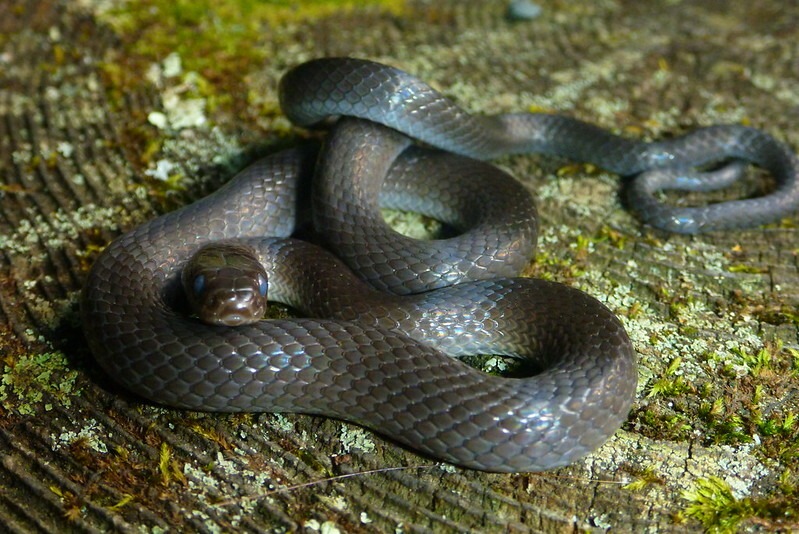 after our brief stop at Sky Meadows we proceeded on to Shenandoah River State Park where we were tipped off about finding some cool herps there. Conditions were not ideal given we had arrived in the middle of the day -dry and very overgrown. Still a no regrets. Scenery magnificent and the Shenandoah River was crystal clear something we don’t always see around Northern VA. After about two hours we left for Skyline Drive and hit some trails within the National Park. We walked a nice flat loop trail only to find that someone had already been through flipping logs and rocks. 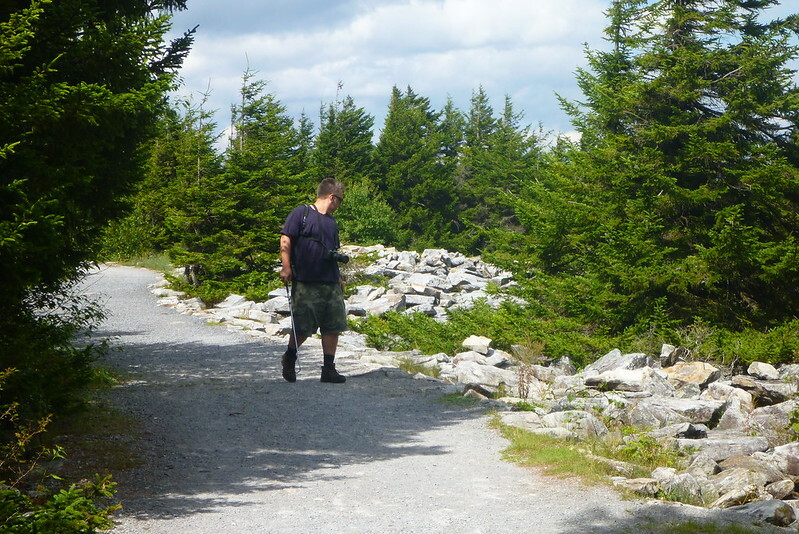 Nonetheless we continued our journey checking logs and rocks and carefully replacing them back the way we found them. 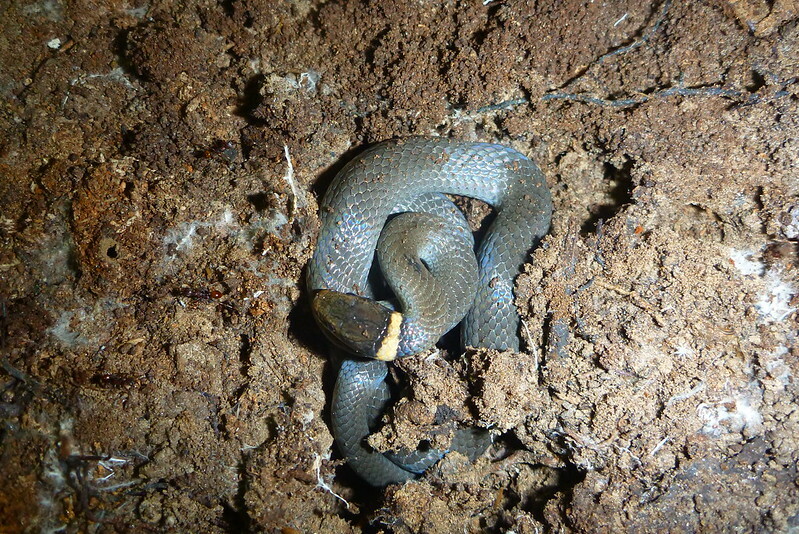 We found several Northern Ringed- Neck snakes. 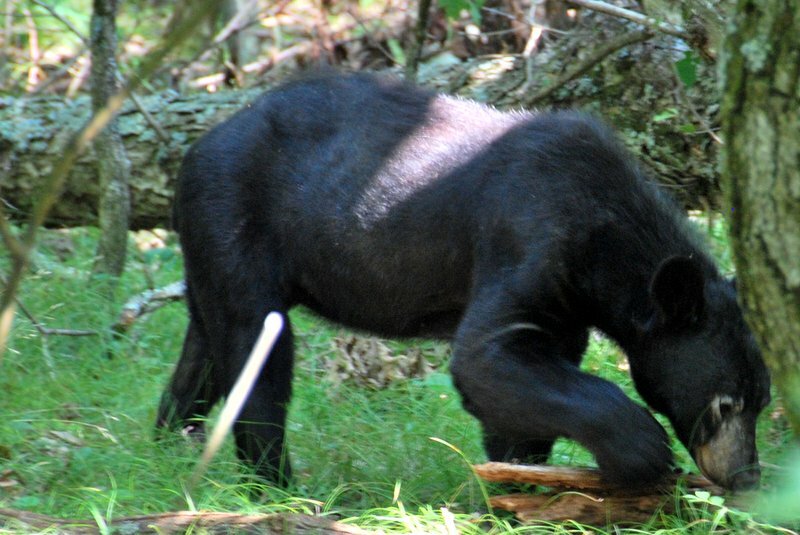 We remained at Skyline until dark taking a few pics of Black Bears and attempted a few pics of Black Ravens then made our way to Staunton, VA to stay the night. 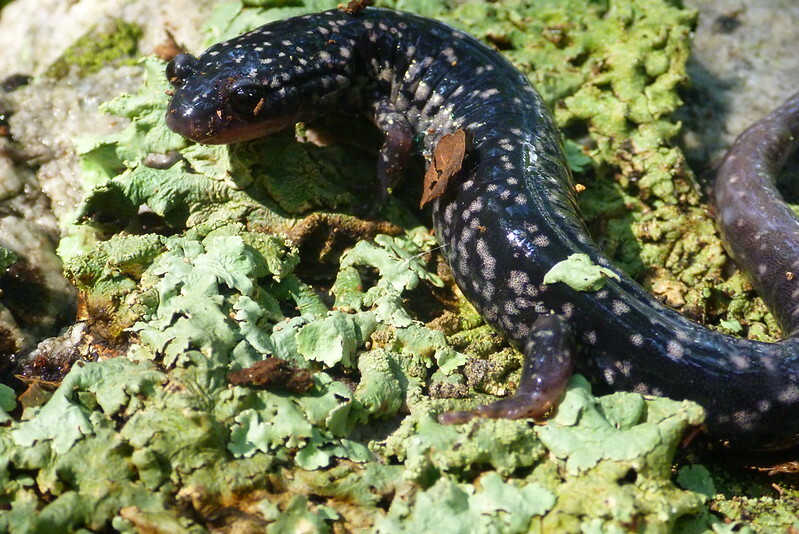 After Leaving Staunton we made our way towards Highland County which borders roughly West VA. We stopped at virtually every roadside picnic area or park finding a variety of dusky salamanders both terrestrial and some semi aquatic. 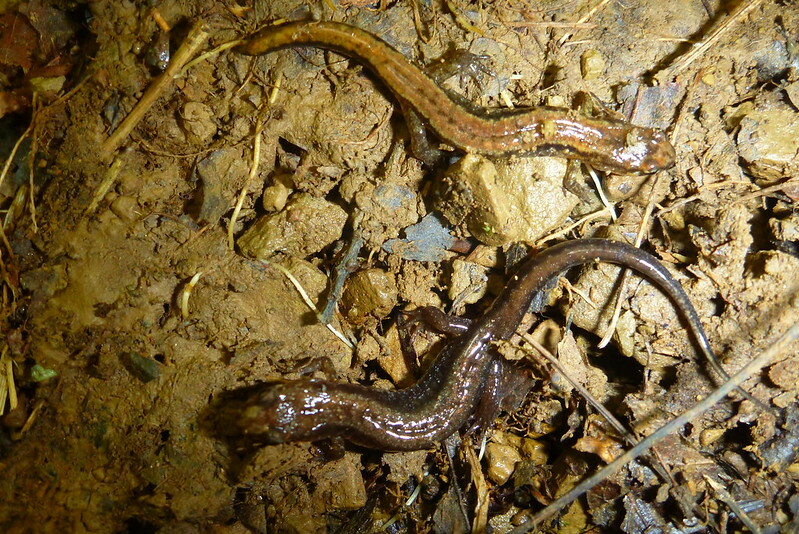 We also found our share of red-backed salamanders as well. 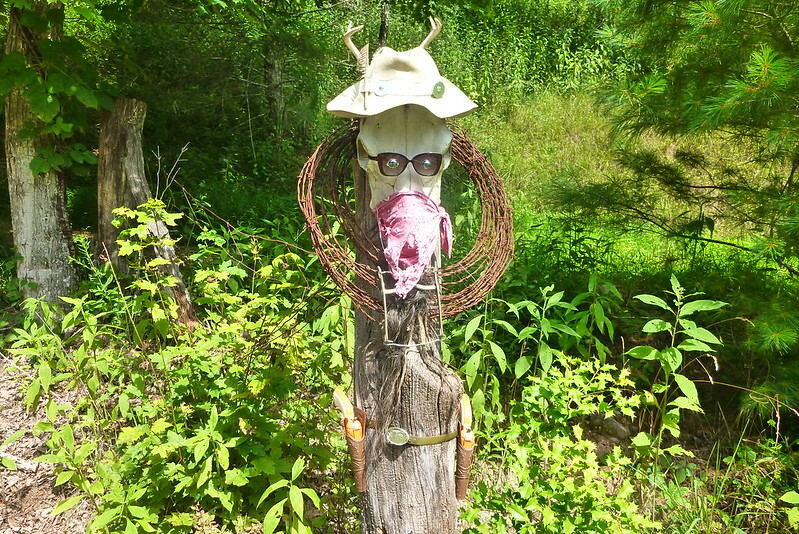 At one particular site we noticed posted on a fence at the entrance to the state property a figure of some sort -fold art or some symbolic warning sign to ward off nature seekers. We were told from people form the area that it was a warning sign. But why at the entrance to State land? Eventually we made our way into West VA but it was by now around 3:30 in the afternoon when we decided to make our way up a mountain road towards Monongahela National Forest. We were low on gas but decided to make the trip anyway. The drive to the summit was approximately 17 miles but turned out to be well worth the trip. The scenery was majestic and there were very few people around. 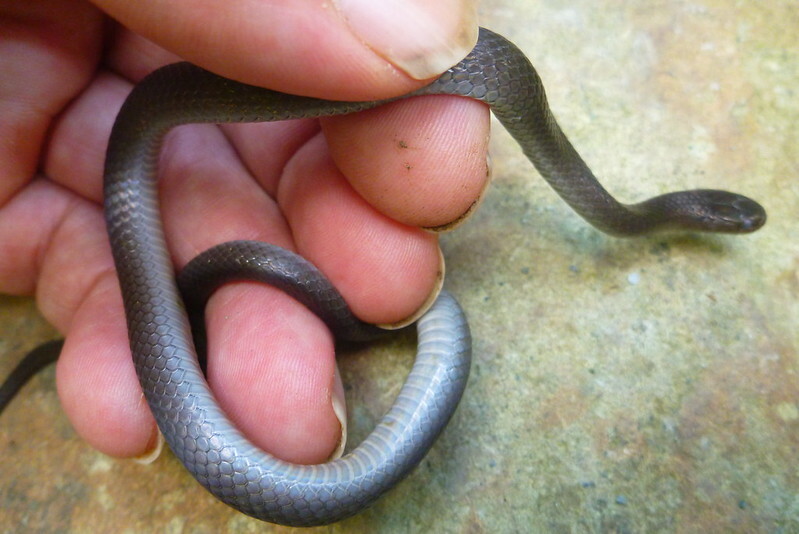 At first we weren’t producing any herps. 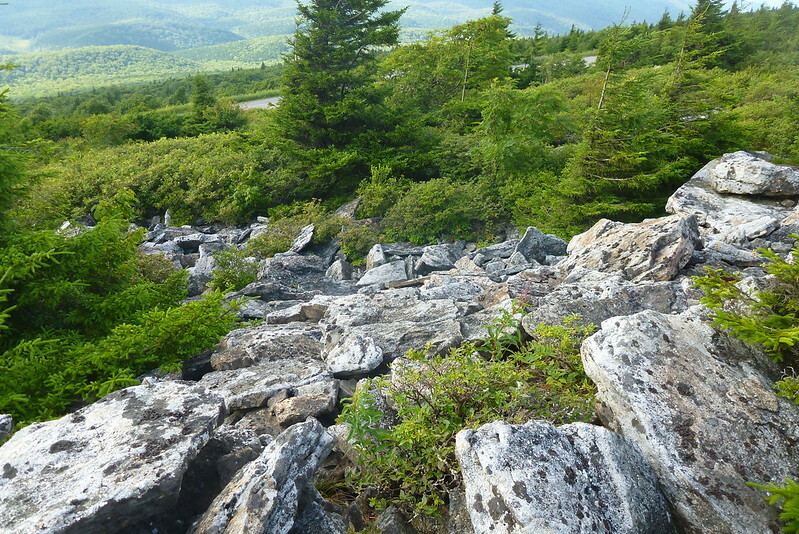 Again as with Skyline Drive it appeared someone had beaten us to the area given many rocks had already been flipped. 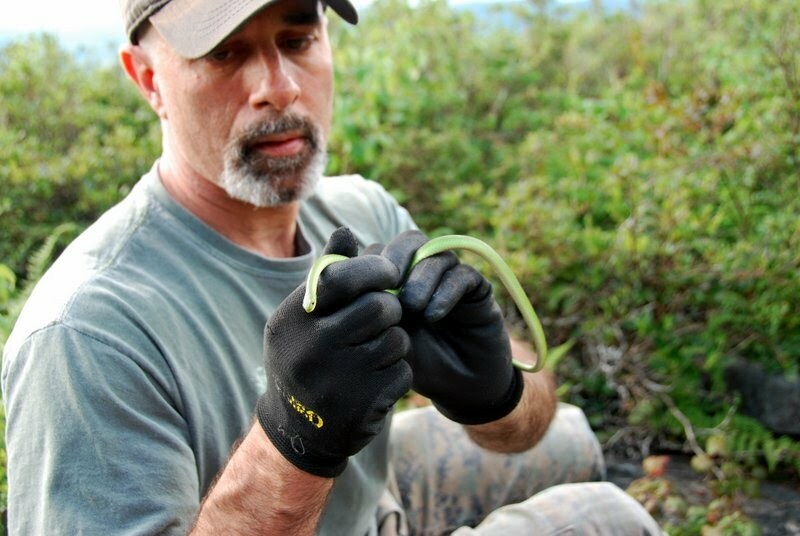 After about 45 minutes Mike found two nice garter snakes. We had our groove on now and our efforts began to pay off. Mike above checking some of the flat rocks along a trail. This area proved to be unproductive however and there was evidence that this area had been recently checked before given the number of flipped rocks. Unfortunately, whoever flipped the rocks before us wasn’t very careful about returning the rocks to their original position so Mike and I found ourselves spending more time realigning the rocks rather than actually surveying critters. The parking lot was where the fun began especially for serpents. 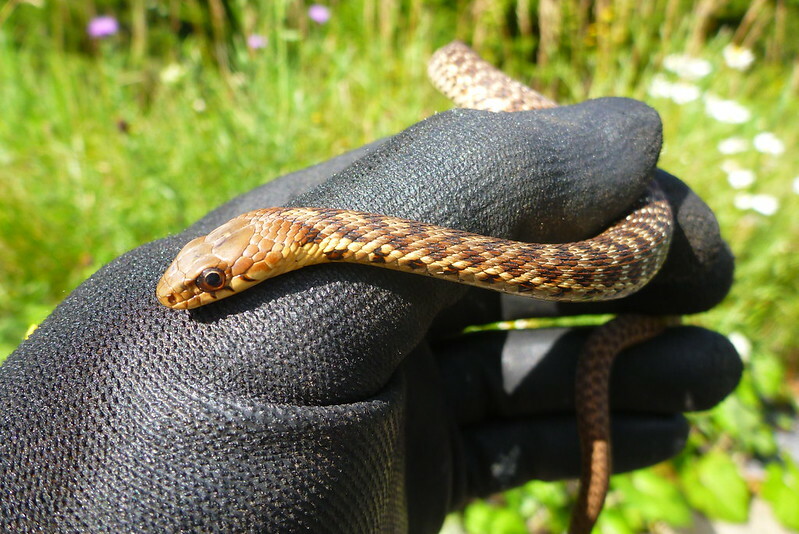 As I mentioned earlier within 45 minutes Mike decided to hit the parking area and begun flipping rocks along the border of the pavement and natural area finding not one but two small garter snakes together. 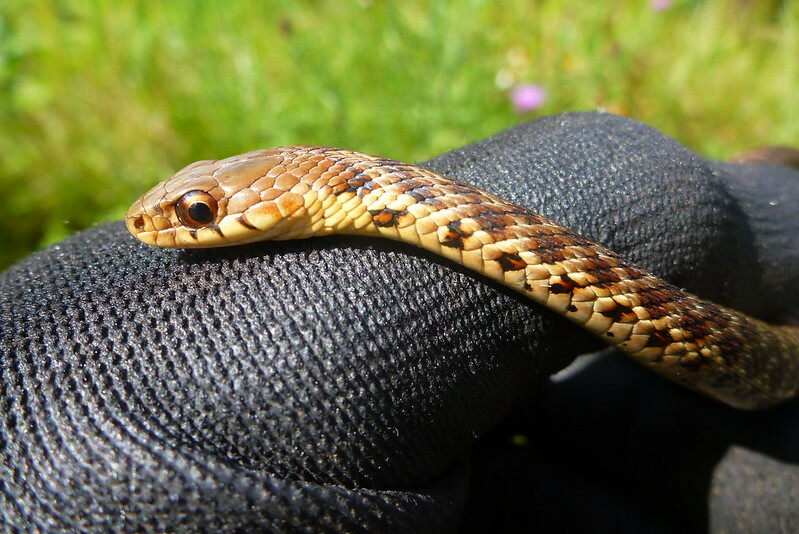 i had my hand at the same finding another garter snake but much larger and of different color pattern. 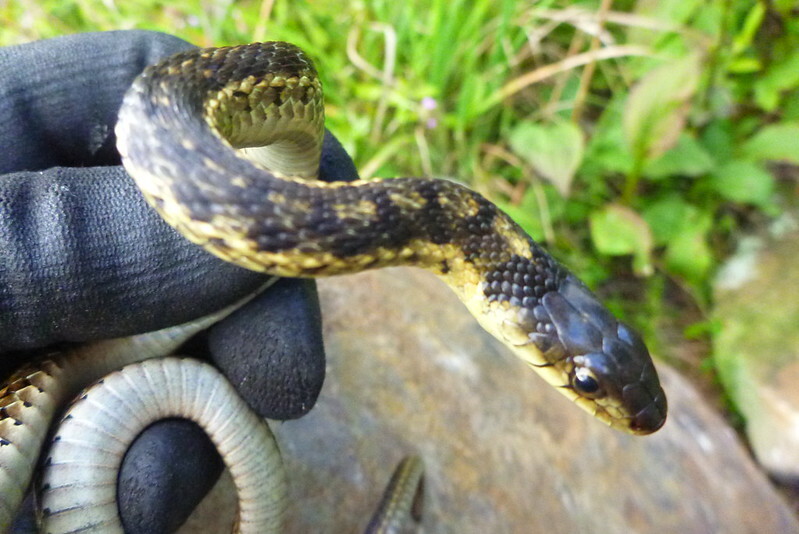 We have observed at least three different color patterns in these snakes ranging from speckled brown and yellow to dark black and speckled. After exhausting our luck in the parking area we decided to move on to the talus slopes. 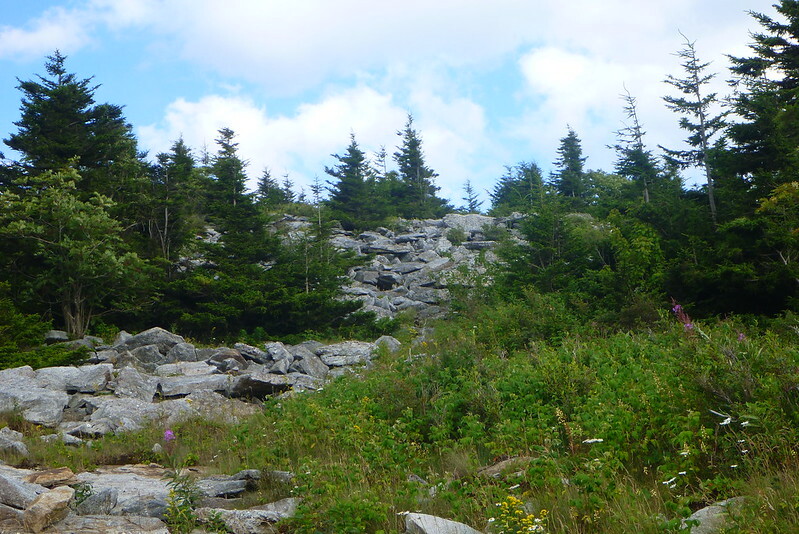 Talus slopes are basically hillsides or slopes with very large rocks the result of millions of years of weathering processes on the mountain. 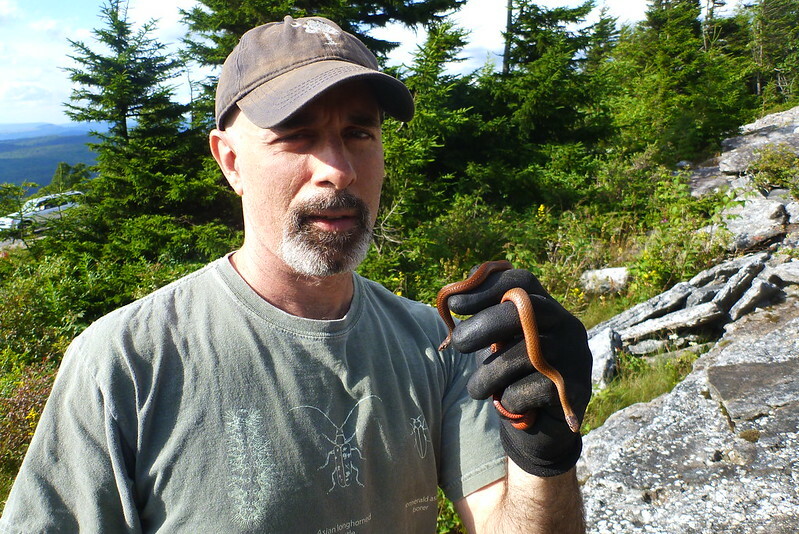 Within minutes Mike yells out “SNAKE” producing two incredibly beautiful colored red-bellied snakes. 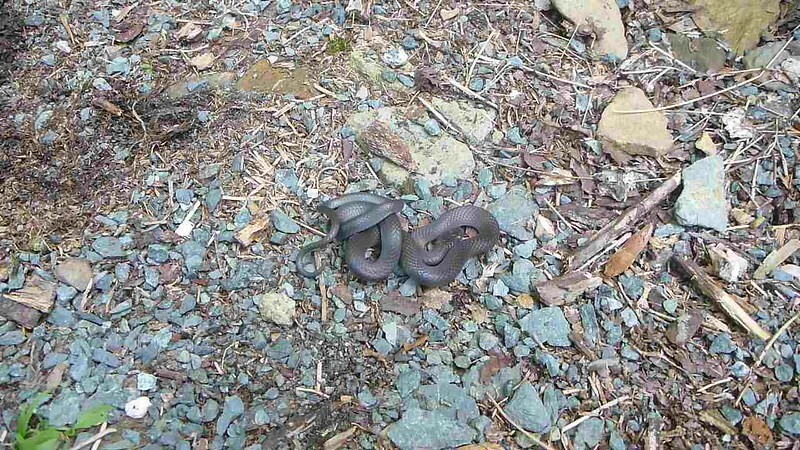 He found the two unexpectedly in some rocks wedged sideways between some larger rocks. Normally we limit ourselves to flat lying, dinner plate sized or larger rocks. 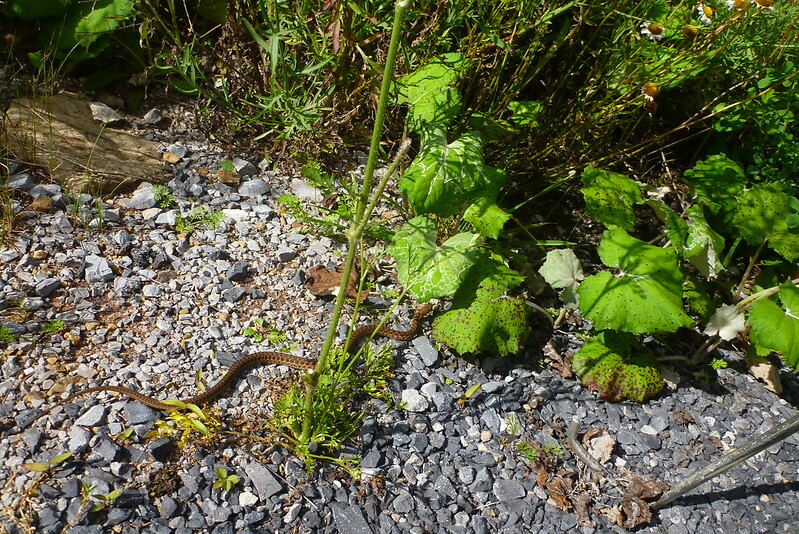 Experience has taught us these flay lying rocks seem to be the preferred hiding places for snakes. 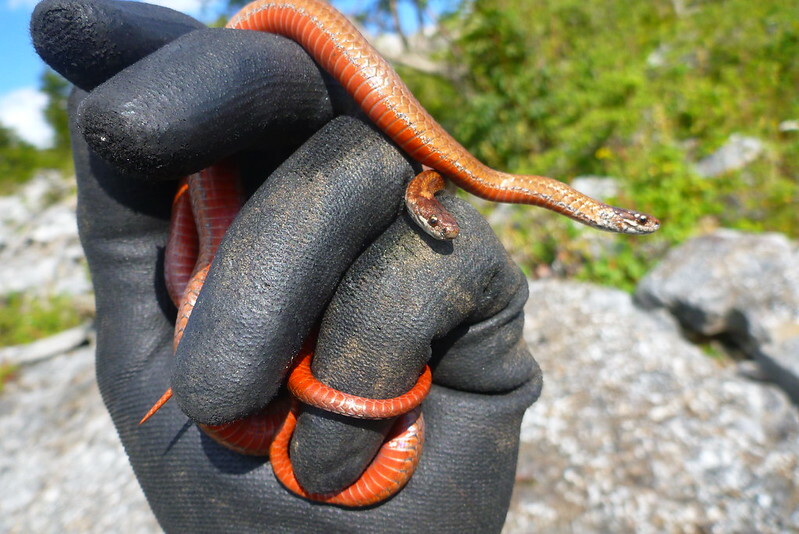 I also had luck finding a few red bellied snakes of my own. Satisfied but also running of daylight Mike and I headed down the mountain and made our way eastward toward our last leg of our tour. 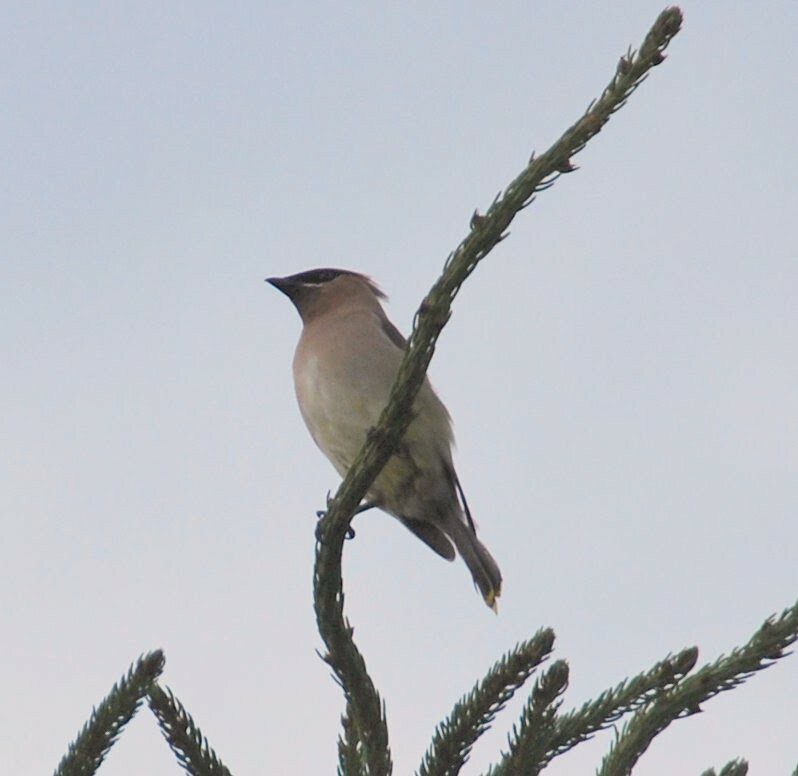 Just prior to our departure Mike picked off a nice shot of a Cedar Waxwing. We ended up staying the night in Strausburg, VA. The next day we drove over to another part of the GW National Forest to a place called Elizabeth’s Furnace. Once again we hopscotched our way through several roadside parking and picnic areas. 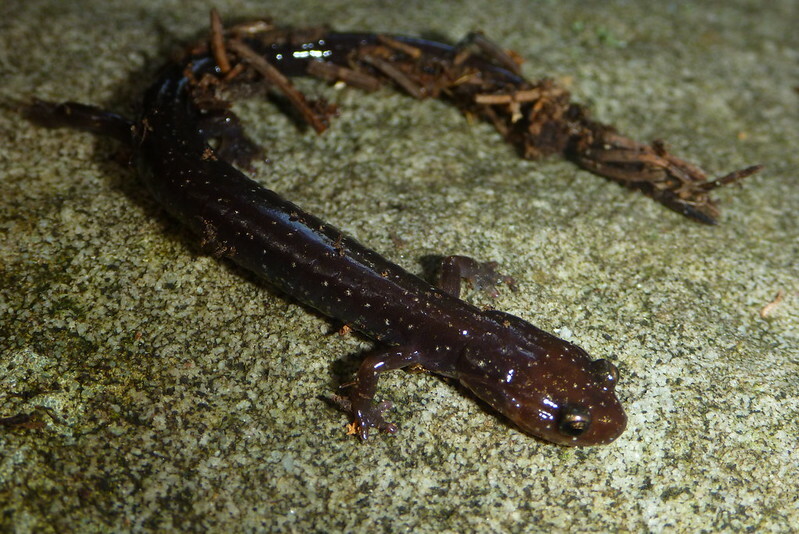 We weren’t very successful at quantity but did manage to find a huge slimy salamander. Overall we considered this a productive trip. We learned where we would spend our time most in future trips to these areas. WE know there is more to discover but given our short time we are definitely satisfied with the experience. 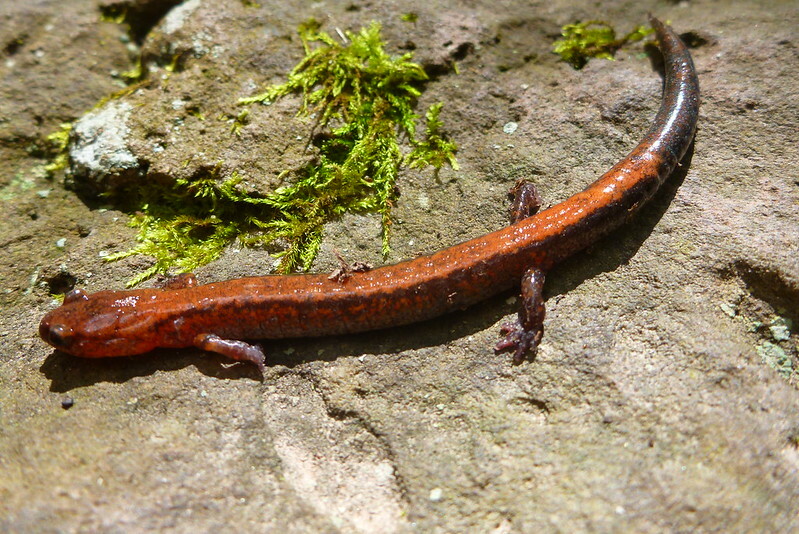 I finally located a Northern Red Salamander in it’s original habitat. 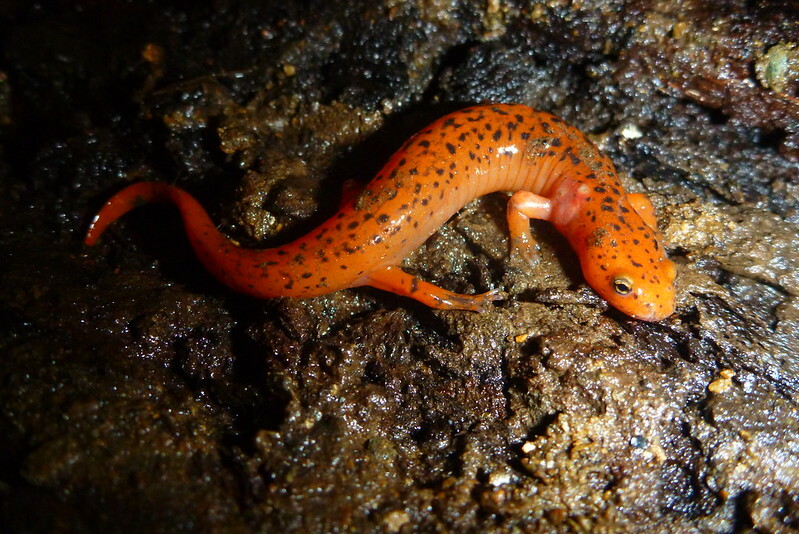 These large robust salamanders have a two stage life cycle like most amphibians. 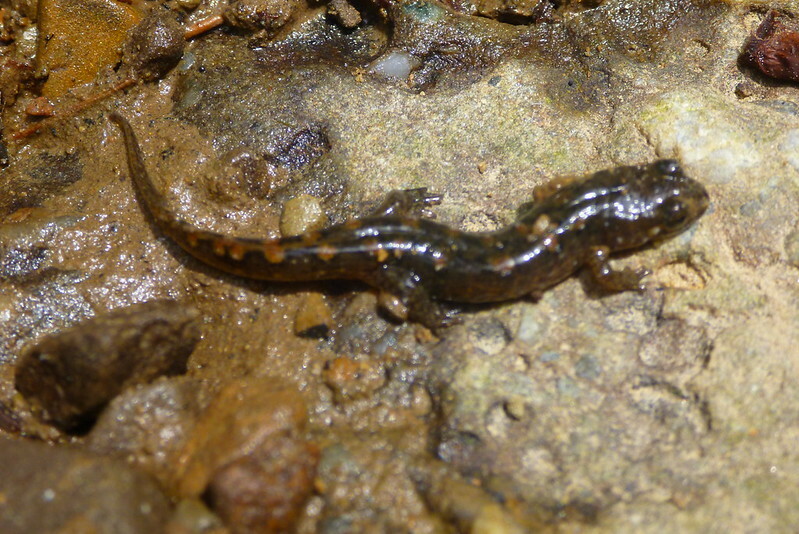 The gilled aquatic larva can be found in clear, unpolluted creeks and seeps that feed into larger bodies of water. 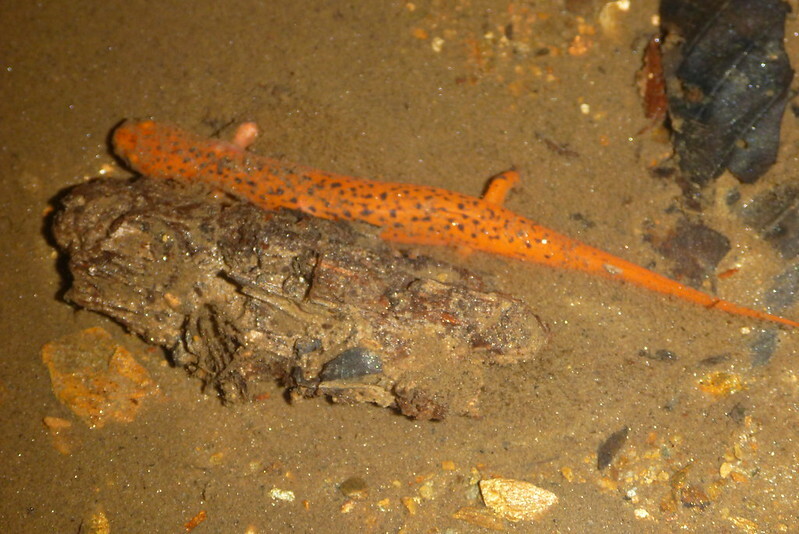 Adults, as shown here, are also found in and around these aquatic environments often under, leaf litter, rocks or fallen logs. The adults may also seek refuge further away from the stream but return to breed in them towards late Fall and early Winter. 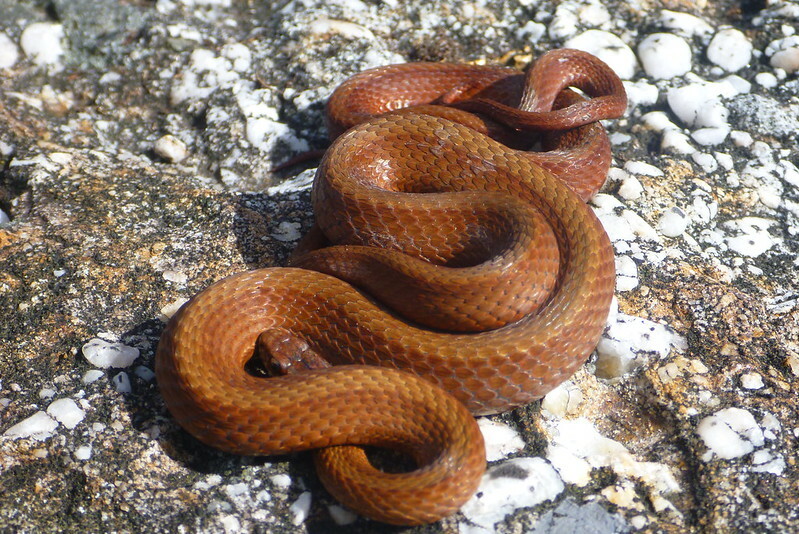 Young adults are strikingly colorful usually red to orange with random black spots on the topside of its body. The color may darken with age. 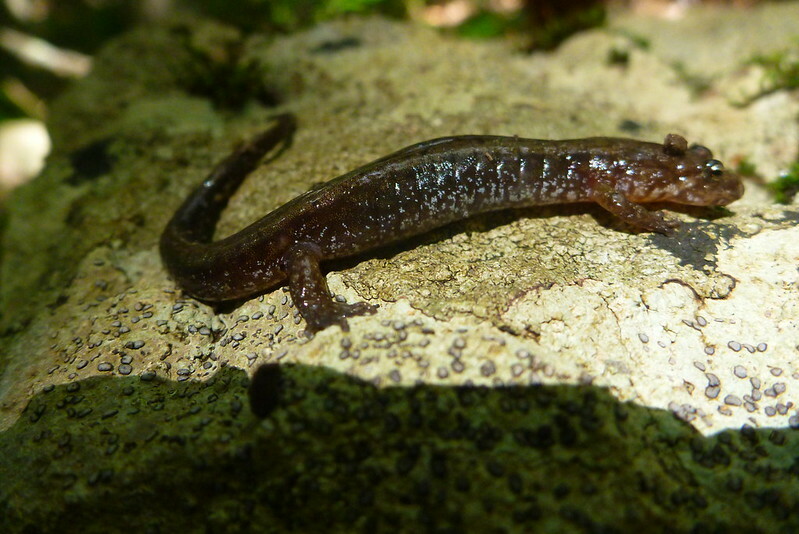 One distinguishing feature between this species and the mud salamander is that the Reds usually have a yellow iris. 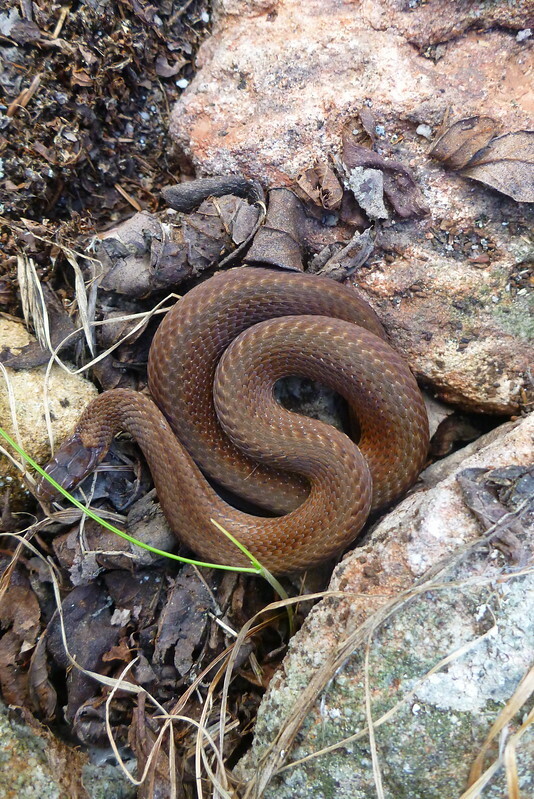 Broadhead Skink nest discovered at Walney Visitor Center. 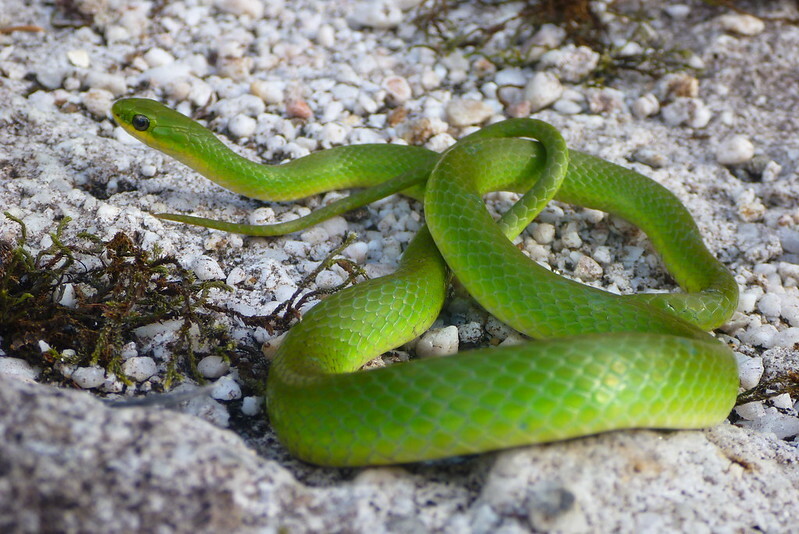 The visitor center is attracts many skinks due to its stone construction. Se video below for full explanation why.